Inspired by friend and fellow prop-builder Jimmy Woody (and shamelessly "borrowing" some of his ideas-thanks, Jimmy! 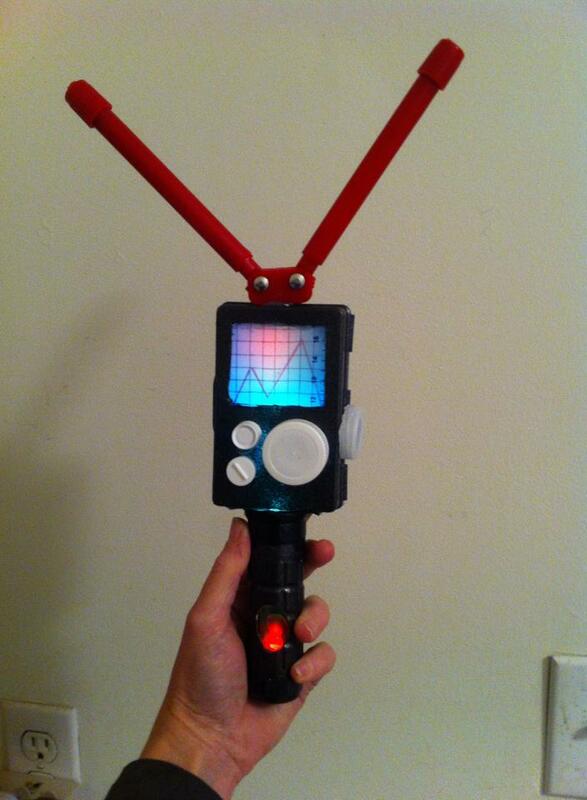 :D), I've started building simple PKE meters to use in the Junior Ghost Hunting workshops I'm now doing at conventions. They're made almost entirely of things I found at the dollar store, or have in my prop-building "junk" box, and even have working lights. And while they don't actually find ghosts, obviously, they do give the younger kids something tangible and fun to hold and interact with while I'm showing the real investigative equipment (which I prefer they *not* hold and interact with, just in case of accidental breakage. As one parent at my last workshop jokingly commented, proton packs are expensive). 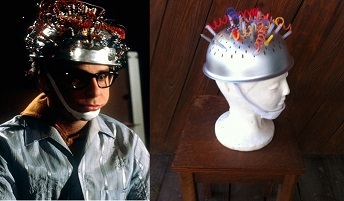 One of my "wish list" prop projects has always been the colander headset prop worn by Louis Tully in the film Ghostbusters. Finding some of the gizmos that go on the colander, however (in particular the various colors of swirly cord,) has taken some digging. However, I've finally gotten the chance to start on this project, and as a sort of warm-up have started building smaller "field" versions of the colander, with similar but not necessarily exact representations of the wiring and other embellishments. The one pictured here is more or less complete, although I may add a few more trimmings for good measure. Coming soon to a convention near you! The first advance copy of The Well-Dressed Puppet has arrived! 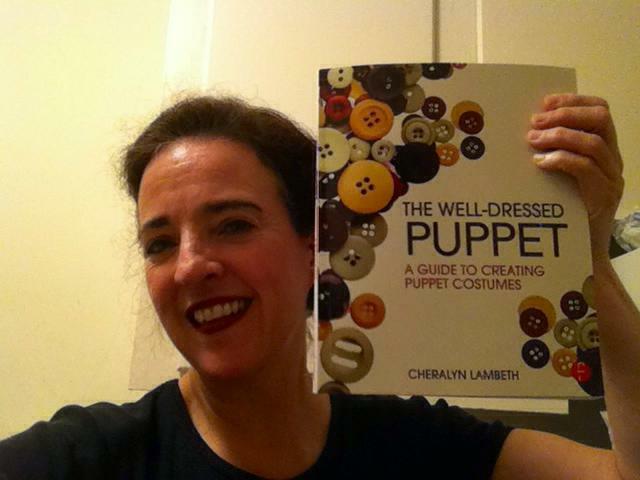 I just received the first advance copy of The Well Dressed Puppet this past weekend! The actual release date is set for September 23, but it's available for pre-order on Amazon here, and I was glad to see that it's also going to be available on Kindle. It's exciting to see a project I've worked on for so long finally come to life! 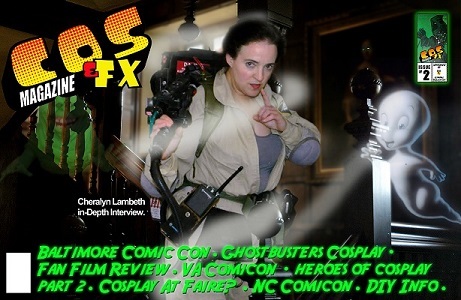 In other writing news, I've been in discussion with the publisher/editor of Cos & FX Magazine, Steve Kimball, about the possiblity of working as a contributing writer for this on-line publication. It's fairly new (having just started earlier this year), and I'm excited about the chance of getting in at the start, as it looks like it may do very well. Steve is also the creator/publisher of Pyrate's Way Magazine, which has attracted millions of readers since it first began; hopefully Cos & FX will do equally well! 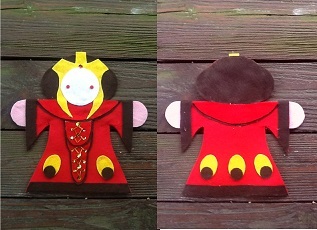 The Well-Dressed Puppet is up for pre-order! Just learned that my book on puppetry, The Well-Dressed Puppet, is now available for pre-order on Amazon, and it looks like it's going to be out even earlier than originally scheduled. That's exciting news! After over a year of having my "fun" costume and prop website set up and in progress, Gallery Quest is finally about to launch! With over 25 years of costumes and props to wade through, both personal and professional, and new projects coming along every day, it's been quite a task to get all the photos organized and ready for the site. Many photos of my earliest projects and cosplays are hard copies, taken in the days before digital cameras, and required a pretty substantial amount of digital clean up before they could be posted (I've learned quite a bit about Photoshop, the hard way). But the job is close to being complete, and I'm looking forward to having a website where I can share my finished work as well as post new finds and projects as I work on them. I've also been working on my companion Facebook page, Gallery Quest Costuming and Props Photo Gallery, as well as my deviantart page (user name GalaxyQuest). I plan to launch both of those in conjunction with my website; they'll have pretty much the same photos/albums, but each will have a slightly different focus. I'll be posting the links for those as soon as they launch--please visit those as well as the site! There are just a handful of gallery albums left to complete before the site is ready to go. It won't be too long now!